Elohim – One God or Two? The word Elohim, when referring to the God of Israel, is grammatically singular and occurs more than 2500 times in the Hebrew Bible. The masculine suffix in Hebrew is “im”, while the female plural suffix is “oth”. Therefore, the word Elohim is a plural masculine form of the root word El or Eloah. When the plural Elohim is used in the Bible it refers to as the majestic plural form of the word meaning majestic or absolute. In Hebrew, this is known as the pluralis excellentiae. Does The Majestic Plural Of Elohim Imply Anything Multiple About God? In order to answer this question, we will take a look at the times that the word Elohim is used in the Bible to describe someone other than Jehovah or Yahweh. In Exodus 7:1, the Lord refers to Moses as Elohim. In Nehemiah 9:18, Nehemiah refers to the “molten calf” that was worshipped by some Israelites as Elohim. In 1Kings 11:33, the word Elohim is used to refer to Ashtoreth (pagan god of the Sidonians), Chemosh (pagan god of Moabites), and Milcom (pagan god of the Ammonites). In the above examples, it is clear that there is nothing plural about Moses, the molten calf, Ashtoreth, Chemosh, or Milcom. Therefore the word Elohim, when referring to Jehovah or Yaweh, does NOT imply plurality either. To believe that the word Elohim implies that there is more than one God, one would have to ignore all of the verses that clearly state that God is only one. The words El, Eloah, and Elohim are used interchangeably in the Bible. The first Commandment in Exodus 20:2-5 (or Deuteronomy 5:6-9) says “you shall not have other gods besides me“. It does not say “besides us“. This is an important point for anyone attempting to claim there are multiple gods. Is God Plural In The New Testament? The plural word for God, Theoi, only occurs 5 times in the New Testament and is used to refer to multiple pagan gods and never to the God of the Christians. In the sermon titled “Seek David In The Last Days” the WMSCOG explains that it was their founder Ahnsanghong who tried to claim that through the word Elohim it was understood that there are multiple “gods”, yet they do not cite any of his books. I’ve read many of his books, and in them he never once claims there are multiple Gods, so I’m not sure where they are getting this from. 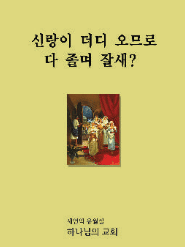 (Please leave a comment if you can cite a work by Ahnsanghong where he claims there is anything other than one God). The word Elohim in the Bible does not determine that there is more than one God Amighty, nor does it imply that there are multiple gods (aka a “mother god”) as the WMSCOG claims for the following reasons. The Hebew word Elohim is used to refer to singular Moses and other singular gods. The Bible clearly states that there is only one God (Isaiah 45:21-22, 44:8, Mark 12:29). The Greek word Theos in the New Testament is NOT plural. If the plurality of God was to be established by the word Elohim then it would have remained constant throughout. Elohim is pluralis excellente. This form is even used for kings in ancient times. [This debate moved to the forum at this thread]. Elohim means divinities or powers. It does not denote anything about gender, about fathers, sons, and spirits, or any such. It refers to the divine powers of Hashem, one deity who has told us to think of Him as a male character. Hey Mr.Ramos, why don’t you quit all this nonsense. Come back to mother and father. Lets go to heaven. This website is only promoting marketing for a book from Steve Hassan. 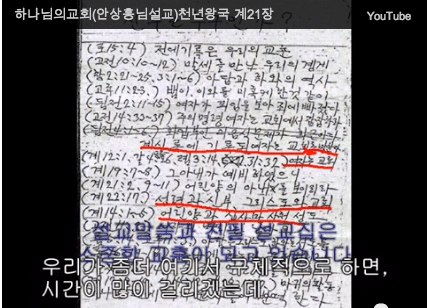 You have no documentation from any organization to prove ahnsahnghong was a Buddhist.please stop with the lies and Lets go to heaven. Come on it’s worth it. By the way, Elohim is plural. The “im” on the ending imputed plurality. Mr.Ramos,you had a baby in 2002 right? You said you told a women to have an abortion but you she is nowhere to be found on the video as a witness. Your lies are supporting Mr.Hassan pocket book. Come back to the truth before father comes. Bring MR.Hassan with you. Lets go to heaven together! !